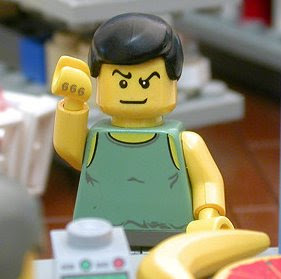 Home » awesome duuuuuuude , bible , christianity , humor , lego , the brick testament , theology » The Brick Testament does the Apocalypse! The Brick Testament does the Apocalypse! Brendan Powell Smith's The Brick Testament is one of my very favorite websites ever. Guess it's because I'm a student of the Bible, and also a lifelong LEGO geek. The Brick Testament is devoted to illustrating the scriptures with the classic building blocks. The wildly popular site has been around since 2001... but only now has Smith gotten around to LEGO-rendering the Book of Revelation! If you don't mind some harsh language for dramatic effect, this is definitely a must-see. I think my favorite part of it might be Smith's take on Revelation 12 and the war in Heaven. So is it humorous? Heretical? An indication that Smith has finally gone too far? Whatever it is, his concise and rollickin'-fun technique with LEGO makes for a far more interesting and thought-provoking examination of Revelation than what the Left Behind novels turned into. For that reason alone, I'm compelled to make The Brick Testament's Book of Revelation recommended reading.